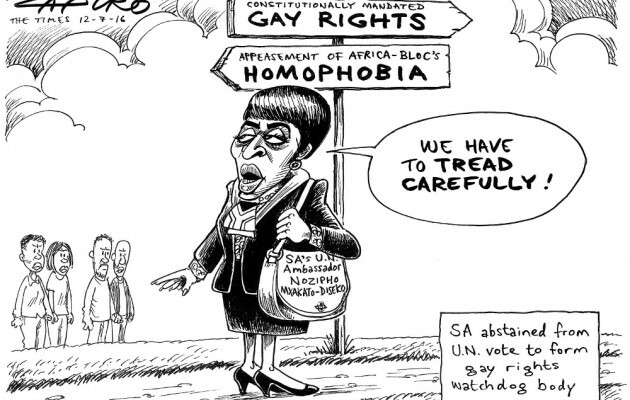 South Africa shocked LGBTI-activists around the world last week when it refused to support a landmark-resolution on LGBTI-rights at the UN Human Rights Council (UNHRC) in Geneva. On Thursday, 30 July 2016, the UN Human Rights Council voted to adopt a resolution on the “Protection Against Violence and Discrimination Based on Sexual Orientation and Gender Identity (SOGI)” that establishes the position of an Independent Expert on SOGI. The expert will be tasked over three years with, among other things, assessing implementation of international human-rights law, identifying best practices and gaps, raising awareness of SOGI-based violence and discrimination, engaging in dialogue and consultation with states and other stakeholders, technical assistance, and capacity-building and cooperation. Remarkably, South Africa – which previously led on SOGI resolutions since 2011 – chose to abstain in the vote. In an angry (in diplomatic terms) statement, South Africa’s ambassador Nozipho Mxakato-Diseko lashed out at the countries that sponsored the resolution: Argentina, Brazil, Chile, Colombia, Costa Rica, Mexico and Uruguay. She accused them of being “arrogant and confrontational”, of “grandstanding, recklessness, brinkmanship and point scoring” and of adding “divisive dimensions” and “unnecessary acrimony” to the Council. Mxakato-Diseko justified this position by suggesting that apartheid had been defeated through “maximum consensus” and not confrontation. She said that the road to LGBTI-equality should be a slow one in which all parties “walk together” including “countries that have challenges with this issue”. Ironically, it was Mxakato-Diseko’s tone that appeared belligerent and arrogant, lecturing the Council on how it should take its time on the rights of LGBTI-people and dismissing the more than 600 organisations from around the world that supported the resolution. Monica Tabengwa from Pan Africa ILGA reports that while the organisation sees the passing of the resolution as a victory, it is “very disappointed” with South Africa’s stance at the UNHRC. “Since 2011 they have provided essential leadership in Africa and they are turning around and they are not being there for us,” she said. Tabengwa believes that while South Africa supports the principle of eradicating violence against LGBTI-people, backing the creation of the Independent Expert was a step too far that would alienate it from other African countries. “It would seem that South Africa has suffered a lot backlash when they led the first SOGI-resolution, particularly from Africa, which is where their trading block is more situated. It was a trade off with that group and it means giving up on the aspirations of its own citizens. They [South Africa] betrayed themselves,” she said. “I feel that South Africa needs to account not only to the LGBTI-community but also to other communities [for its stance]. It never ends with one minority group – there will be others. This needs to be curbed and addressed now so that they don’t behave in this unethical manner,” Tabengwa added. 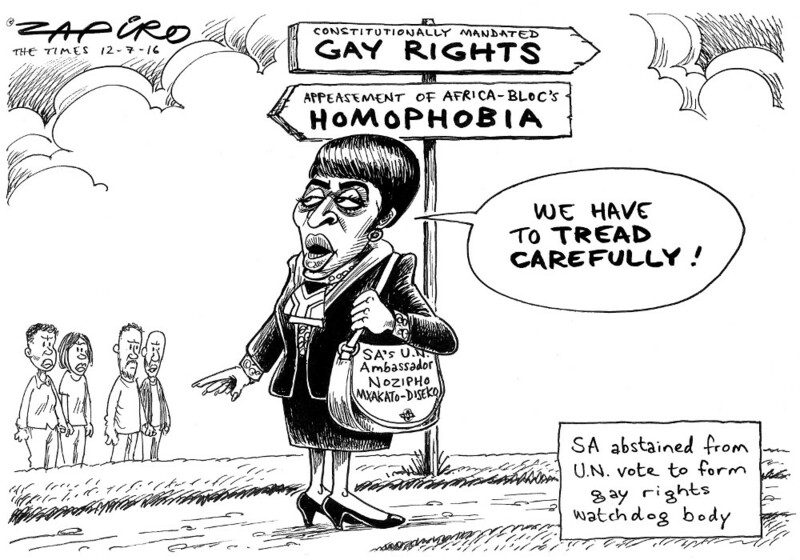 Is the SA government bowing down to pressure from homophobic leaders in other African countries? The art of friendly but principled diplomacy à la Mandela seems to lost.